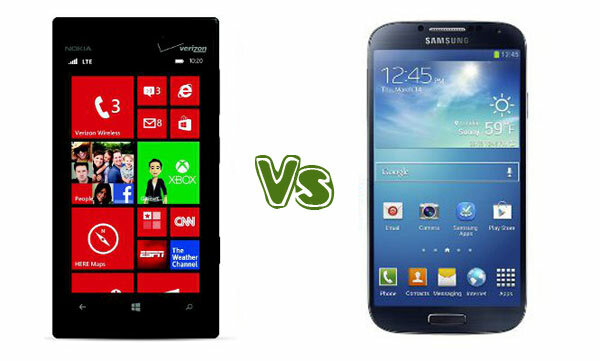 Here is the detailed comparison of the Nokia Lumia 928 VS Samsung Galaxy S4. In the battle arena of smartphones, there is simply no place for the good old, tried and tested handsets, as the new incredibly powerful warriors push the old ones out. The global smartphone market is overcrowded with innumerable mobile companies trying to produce better devices than their rivals. Companies small and big are all offering great devices to the consumers at a varying price range, and the consumers of the smartphones have plenty of options to choose the right device for themselves according to their individual budget. This humongous competition is not only between all the smartphones, but there is a subdivision as well. Smartphones come in two basic variants based on their software, namely the Android powered smartphones and the Windows powered smartphones. Although, the Android based smartphones are rather more dominant in the market thanks to the Samsung Galaxy range and the Apple iPhones, the Windows based smartphones are also very efficient and powerful and are no less in any way compared to their Android counterparts. Perhaps the Windows based smartphones have come up the mobile ranking only for the Nokia Lumia series that have been very popular and are creating a big wave in the market. The yesteryear’s mobile emperor Nokia had been completely defeated, as new immersing powers surged in. Nokia had long back lost its crown to the current tech leader Samsung and few others have also surpassed it in stature. When the Finnish mobile major, once acclaimed for its superior built quality and durability was about to be lost in oblivion, it gathered up its powers and produced an innovation and powerful devices apart from being durable. This was the Nokia Lumia series. This single flagship has lifted up Nokia’s stature as well as its spirits in the market. The Lumia series have been an instant hit so far and Nokia is not stopping to produce even better models in the Lumia brand. On the other hand, Samsung is in cloud 9 with its Galaxy models, especially after the launch of its latest device in the Galaxy line up, the S4. The Samsung Galaxy S4 is a premium Android-based smartphone with great innovative features and powerful specs that have outshone the Apple iPhone 5. The device has been an instant hit owing to its sheer powerful aspects. However, even this latest Galaxy device is not beyond competition and it will see a lot of rivalry soon. The only capable Windows based handset that can match up to the Galaxy S4 is a latest Nokia Lumia model. The Nokia Lumia 920 has seen a great amount of success, and everyone was waiting for the highly speculated Nokia Lumia 928, a further enhanced device that would be exclusive with Verizon. There’s a lot of talk that the Nokia Lumia 928 can even beat the Samsung GS4 in competition. Considering the capabilities the new Lumia 928 can really give tough competition to the Galaxy S4. Though the Nokia Lumia 928 device is really not available for a thorough review as yet, there is enough available detail on the device that can be used to compare it with the GS4. Let us take a look at the Nokia Lumia 928 and place it against the Samsung Galaxy S4 to see whether the Windows 8 phone can really beat the Android Jelly Bean powered handset. Nokia is powering the Lumia 928 with a dual core Qualcomm Snapdragon processor running at 1,500 MHz and this is coupled with 1GB RAM. The Lumia 928 comes with an internal memory of 32 GB which cannot be expanded as Nokia is not offering a microSD card slot. On the other hand, the Samsung GS4 certainly has an upper hand when it comes to the power of the processor. The Galaxy S4 offers a quad-core Snapdragon (an even better Octa core outside US) processor running at 1,900 MHz along with 2GB RAM. The device comes with an in-built storage of 16 GB along with a microSD card slot to expand the memory further up to 64 GB. The Galaxy S4 runs on Android’s latest version 4.2.2 Jelly Bean and on top of it there is also the company’s custom made TouchWiz. These changes and upgrades have made the device to offer improved experience. However, the overall OS experience is still close to that of the preceding model Galaxy S3. Someone who is not particularly fond of the Android 4.1, the 4.2 will not impress him either. The Nokia Lumia 928 runs on the Windows Phone 8, which is probably the best implementation of mobile Operating System from the house of Microsoft. Nokia had taken a big step in bidding adieu to Symbian OS in 2011 and chose the Windows Phone 8. Nokia is betting big on the Windows 8 OS and it is definitely a huge improvement over the Symbian OS. Then again, for someone who finds the Android OS rather drab and dry, the Windows OS can be a welcome choice, as it offers a user friendly and superbly vibrant user interface. The Samsung Galaxy S4 sports a great screen that is one of its biggest plus points. It shows off a 5 inch Super AMOLED touchscreen with 441 pixels per inch and a screen resolution of 1,080 x 1,920, which produces crystal clear display. With a large screen it is also very close to being a Phablet. The Nokia Lumia 928 sports a 4.5 inch display along with 334 pixels per inch and a screen resolution of 768 x 1,280. However, the specifications don’t say all, as the Lumia 928 offers a spectacular and colorful display and is in no way a lesser counterpart of the GS4. While a slightly smaller screen might be favored by some as it is easier to hold it comfortably. The Lumia 928 sports an incredible primary camera with Carl Zeiss sensor but with 8 Megapixel which is definitely lower than the 13 Megapixel resolution of the Galaxy S4. Considering everything, it is clear that though with lower specs the Nokia Lumia 928 is a worthy contender of the Samsung GS4, the rest will be known when the device hits the markets. Next: Who Is The Nokia Asha 501 Geared Towards?